Two engines versus four engines was a hot topic in media reports from July's Farnborough, England, Air Show, where Airbus stirred the debate with a colossal billboard at the edge of a runway that read, "A340  4 engines 4 long haul." Similar full-page ads appeared in air show magazines and daily London newspapers. 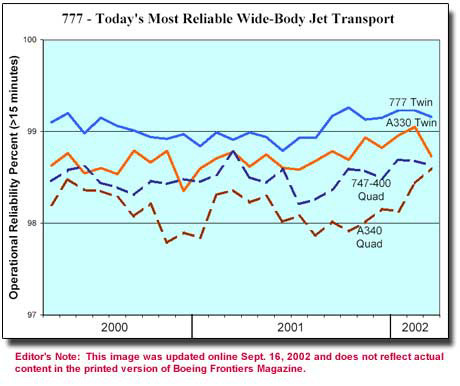 While Airbus officials argued that the ads were not about safety, the prevailing opinion of industry experts at the show was exactly the opposite  the ads were meant to suggest that twinjets, such as the Boeing 767 and 777, were not as safe or reliable as four-engine airplanes, namely the Airbus A340, the closest competitor to the market-leading 777. Airplane engine manufacturers were among those in the industry voicing their disapproval of the ads run at Farnborough. "We are vehemently opposed to what Airbus is doing here," said David Calhoun, president and chief executive of General Electric's GE Aircraft Engines to The Wall Street Journal. "An ad like that is the last thing this industry needs right now." In the same article, a Pratt & Whitney spokesman commented, "Twin-engine airplanes are every bit as safe as four-engine airplanes." At issue is extended operations (ETOPS), which means twin-engine aircraft meeting certain criteria are allowed to fly long-distance routes that, in some cases, can take them up to three hours away from the nearest airport. In the event of an engine failure, all airplanes are required to divert to the nearest suitable alternate airport. However, if a four-engine jet loses one engine, it is allowed to continue to its original destination if safety is not compromised. As the Farnborough media reports were quick to note, this was not the first time Airbus had created controversy with its advertising strategy. In 1999, Airbus released and then pulled from circulation an ad that conveyed a similar theme. That ad showed an A340 flying over a vast, stormy ocean, with a caption stating, "If you're over the middle of the Pacific, you want to be in the middle of four engines." A firestorm of negative reaction from customers and other industry organizations led Airbus to stop running the ad. Nicole Piasecki, vice president of Marketing and Business Strategy at Boeing Commercial Airplanes, saw it this way: "It seems intellectually dishonest for Airbus to make statements like this, when there are many airlines flying two-engine A310 and A330 airplanes over the Atlantic. 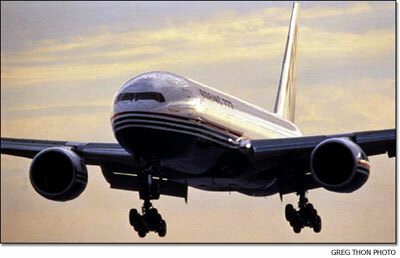 The four-engine A340 has not sold nearly as well as the twin-engine 777. This ad strategy appears to be an attempt to boost sales by playing on unsubstantiated fears, and we don't believe playing on public fears has any place in advertising." Since the twin-engine 777 was introduced in 1995, the Boeing jetliner has outsold its Airbus competitors by a wide margin, capturing nearly 70 percent of the market. There are 30 airlines worldwide operating 777s. "The operation of Airbus twin-engine aircraft under ETOPS regulations is a commonplace phenomenon in the four corners of the globe. "The passengers also benefit from ETOPS on those long routes between city pairs where the traffic would not be economically viable for larger aircraft but could be supported by a smaller twin." According to proponents of four-engine jets, if a twinjet loses one engine, the airplane and passengers could get stranded at an alternate airport that is remote and inhospitable, where there are no decent airport, food or lodging facilities. 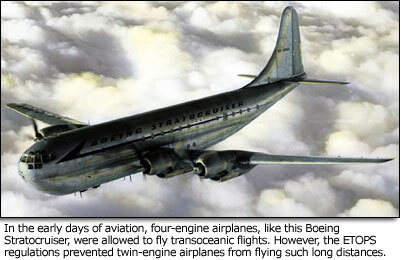 On the other hand, a four-engine jet could, if it met certain stringent safety guidelines, continue to its destination. But as Boeing Commercial Airplanes Vice President of Marketing Randy Baseler pointed out, "Don't fall for this four-engine stuff. If an engine goes out on any airplane, many times the safest option is to land at the nearest airport rather than continue. "Think of it this way," Baseler said. "If you have two engines, there are two chances of engine failure. If you have four engines, there are four chances of engine failure. The chance of engine malfunction doesn't go down with four engines; it goes up." It also is important to note that more than 90 percent of airplane diversions have nothing to do with engines but rather involve weather, a sick passenger or other reasons, Baseler said. "We believe the issue is really about getting passengers where they want to go in the most reliable way," Baseler said. "And reliability is one of the main reasons so many of the world's major airlines choose the 777." 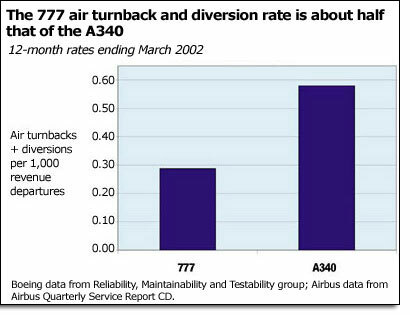 According to Baseler, records for the four-engine A340 show it has had twice as many diversions and turnbacks as the twin-engine 777, and the A340 has a lower average dispatch reliability rate than the 777. In some three million ETOPS flights logged since 1985, no twinjet has ever been lost during the ETOPS portion of the flight, which is the portion when the airplane is farthest from an alternate airport. More than 1,000 ETOPS flights take off every day. The Boeing 777 has had only one diversion for inflight engine shutdown during the ETOPS portion out of over 300,000 flights in the past seven years. "Obviously, we have proven that twin-jet long-haul flights can be done  and done safely  so why waste precious resources by adding two engines that aren't needed?" said Baseler. "In the case of the A340-600, those two extra engines add a 20 percent higher fuel burn per passenger over the 777-300ER." In sales campaigns between the 777 and the A340, Boeing can point out the larger 777-300ER has 18 percent lower operating costs per passenger than the A340-600 on the same route. "As an airline operator, you would prefer the 777 for its low operating costs," said Baseler. "As a passenger, you would prefer the 777 because you have a better chance of getting where you want to go without a diversion, a better chance of on-time departure and an award-winning, comfortable interior." Sir Richard Branson, whose Virgin Atlantic Airways took delivery of the first A340-600 during the Farnborough Air Show, has said that his company's market research shows "there was something like 17 to 18 percent of passengers who go out of their way to fly a four-engine plane on a long-haul flight." But independent passenger preference surveys show that three out of four passengers prefer the 777 over its competitors, and airlines have reported it is easier to sell seats when a 777 is flying a route. "One airline reported a 30-percent increase in revenue on some routes when it flies the 777 on those routes," said Chet Ekstrand, Boeing vice president of Regulatory Affairs.  To keep their ETOPS approval, airlines are required to perform additional maintenance and monitoring procedures on their airplanes used for ETOPS flights.  Boeing and other aerospace companies are challenged to make engine-reliability improvements and aircraft-design enhancements to meet higher safety and reliability targets.  Airlines are required to share information routinely on the causes of diversions and turnbacks to help identify trends in the world fleet and reduce the recurrence of such events. "Also, because ETOPS has made direct, non-stop flights the norm, passengers are exposed to fewer flights, proportionately reducing their risk," Ekstrand pointed out. The ETOPS requirements have had a positive safety effect on airlines' non-ETOPS fleets as well. "Having seen the benefits in their ETOPS airplanes, many airlines choose to extend the special ETOPS-required technical standards to their entire fleets," Ekstrand said. "They know from experience that these simple enhancements can cut costs significantly by reducing departure delays and in-flight engine shutdowns." Seventeen years of proven ETOPS flight success, coupled with even greater advancements in engine operational safety, have paved the way for even longer point-to-point flights. In June 2000, the Federal Aviation Administration tasked an aviation rulemaking advisory committee to study ETOPS requirements. The committee is expected to make public its findings and recommendations shortly. "Hopefully, this will set the stage for flights with even longer diversion times in the South Pacific such as Australia to South America," Ekstrand said. Boeing is determined to make sure that the traveling public does not buy into the perception that four engines have any reliability advantage over two-engine jets. "We are going to be aggressive in combating misinformation about ETOPS," Piasecki said. "It is important that passengers and customers know the facts." In the early days of commercial aviation, piston engines, which were much less reliable than today's modern jet engines, were used on airliners. Airplanes with only two engines were restricted by the U.S. Federal Aviation Administration from flying on routes that took them more than 60 minutes from an adequate alternate airport. This was known as the "60-Minute Rule," which in essence limited transoceanic flights to three- or four-engine propeller airplanes like the DC-4 or Constellation. But as jet engines proliferated in the 1970s, the 60-Minute Rule quickly became outdated. "Jet engines had achieved a tenfold reliability improvement over piston engines," said Chet Ekstrand, Boeing vice president of Regulatory Affairs. By 1985, the FAA had accumulated sufficient historical data to conclude that modern twinjets were so reliable that the 60-Minute Rule was no longer necessary. "120-minute ETOPS" was born, which meant airplanes meeting the ETOPS criteria could fly up to two hours from an alternate airport. Three years later, this was increased to three hours, and 12 years later, based on the superb three-hour ETOPS record, 207-minute ETOPS flights became available on a case-by-case basis for 777 operators flying the North Pacific. "ETOPS made it possible for airlines to offer more direct non-stop flights across the Atlantic and elsewhere in the world," Ekstrand said. For instance, before ETOPS, a typical routing for a family traveling from Bavaria to North Carolina was via Paris and New York  a total of three flights. Now, they can take a direct, non-stop flight from Munich to Raleigh-Durham. Medium-capacity, fuel-efficient airplanes such as the Boeing 767 and 777 now provide non-stop flights between city pairs that had no direct service before. Thus, travelers no longer are forced to fly through gateways like New York. © 2002 The Boeing Company. All rights reserved.